Editorials from Theslowlane: CAFE Standards, A Waste Of Effort? CAFE Standards, A Waste Of Effort? 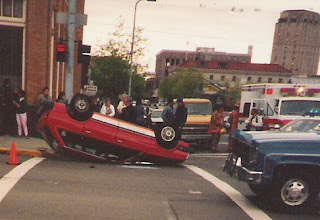 Car flipped over. I saw this one day walking downtown with my camera. Luckily no one hurt. CAFE stands for "corporate average fuel economy." Trying to get car makers to increase the gas mileage in the cars they make, but the whole effort could be a waste of time. Better to just get people to drive less, rather than bother with trying to regulate the auto industry in this way. One way to make a car more efficient is, of course, to make the car smaller and lighter. Well, I can see why people still buy the bigger cars. Who wants to be crushed in a little cracker box during an accident? And thousands upon thousands of people die each year in accidents. Why do people go for larger vehicles? A bit of extra gas is a lot cheaper than hospitalization. It makes sense. There may be some other magical "technology fix" that improve gas mileage, besides reducing car size and or weight. Maybe CAFE standards can "drive" some innovation in this technology, but we keep looking for that magic potent. We keep looking, as if the corporations are God. Do the corporations really have a magic wand that they just don't want to use out of belligerence? Well, what about the stubbornness of the American people who insist on driving? I recently heard Congressman John Dingell (from Michigan) say, in a radio interview (if I remember correctly), that Europe doesn't have CAFE standards. Yes, Europe doesn't have CAFE standards? They put higher taxes on gasoline, rather than bothering with CAFE. I guess that would be "Europe as a block" or most European nations? Europe doesn't bother trying to regulate auto efficiency. Instead, they put stiff taxes on gasoline. When gas is more expensive, the market favors more efficient cars. Also (I might add) the market uses more public transit, bicycling and walking. Here in USA, fuel prices fluctuate. When prices go up, fuel efficient cars become a short lived fad. Auto makers start tooling up for the new market reality; roads filled with tiny vehicles. Then gas prices drop before factory retools can even make it off the drawing board! Big cars with more padding and safety come back into style. Our roads become a scary mix of gas conscious tinderboxes versus road hogging monsters. When it comes down to survival of the fittest, who wins? Not the gas conscientious. Well, maybe I win when I am riding a Greyhound bus. On my bicycle, I am usually out of the battle, for the most part, if I can find a shoulder. Maybe that's not as safe as Greyhound, but it's much better than being in the traffic pattern on a motorcycle, for instance. Most of the time, gas is still a bargain in USA. Gas is an amazing bargain when compared to the costs of hospital stays and health insurance plans.